With buckwheat and red velvet, the Pancake Project serves up taste and health. THE phrase a�?flat as a pancakea�� needs serious rethinking. 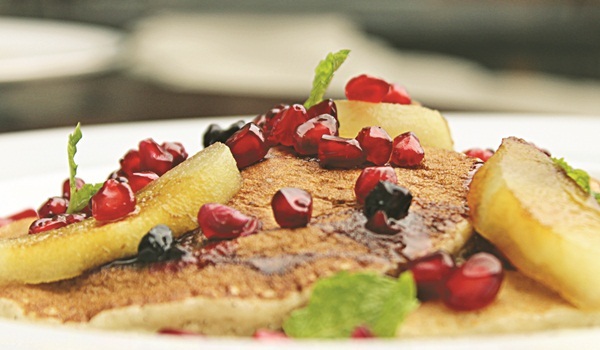 At Park Hyatt, pancakes rise to new levels of elegance as the Dining Room celebrates the surprisingly versatile breakfast staple with a 10-day festival. Admittedly, Ia��m wondering if the sweet servings might make me feel that I began the day eating dessert, but also curious how different executive chef Teuku Syafrulsyaha��s offering might be. So wea��re treated to a demo of gluten-free options from the menu. The first ladle-full of batter lands on the pan with a dramatic sizzle. Banana slices with cinnamon tumble in. The Buckwheat Banana Pancake, embellished with fruit and nuts, seems perfect for health fiends who dona��t publicly cheat on their diets. But I give the Oatmeal Pancake a miss as it sounds a tad too safe! A flamboyant pink batter gets our attention. Our guess (a�?strawberries?a�?) is wronga��surprisingly, ita��s a Coconut Velvet Pancake. Served with splashes of coconut cream, wea��re delightfully confused over which gets our votea��till more variations arrive. a�?This onea��s got organic millet, peach compote and nuts,a�? says our chef, spooning over a sinful glucose syrup that has a burnt-just-right twist to it. A chorus of exclamations follows. And therea��s still the savoury variation with bacon to get reckless with. Just three weeks in Chennai, Chef Teuku is loving the latest stop in his Hyatt adventures around the worlda��from Indonesia to Dubai to Zanzibar.A� Looks like our city is going to love him right back, as he gives the many splendoured pancake its due.